International Foodsource (IFS) is one of the largest suppliers of nuts, dried fruit and snack items in the northeast United States. As a major provider of snacks to grocery and convenience stores nationwide, IFS focuses on delivering the highest quality and best-priced bulk foods to processors, manufacturers, stores and other volume buyers. Their modern 200,000 square foot facility is located in Dover, NJ where they can ship within one day to 50 million consumers. IFS imports a rapidly changing menu of items from all over the world. While their black and white label needs were met by a Zebra printer, they wanted to improve the sophistication of their labels and add color. But their complex logistics and high volume required a printer that could print quickly and be trouble-free. FS purchased a SwiftColor SCL4000 desktop printer unit about a year ago just to “try it out.” But it has quickly become a dependable workhorse and important tool in their marketing arsenal. 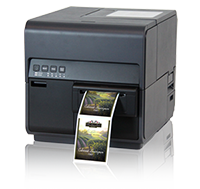 The SwiftColor 4000 desktop printer at IFS is being used today for 15 different label designs, printing approximately 20,000 small (2 x 1.5”) color labels/month. Up next? Expanding the usage to larger labels. With a product line that ranges from dried fruit to beans to grains, rice, lentils, peas and spices - there is a lot of demand for vibrant color that distinguishes the many boxes and jars shipping out from International FoodSource.